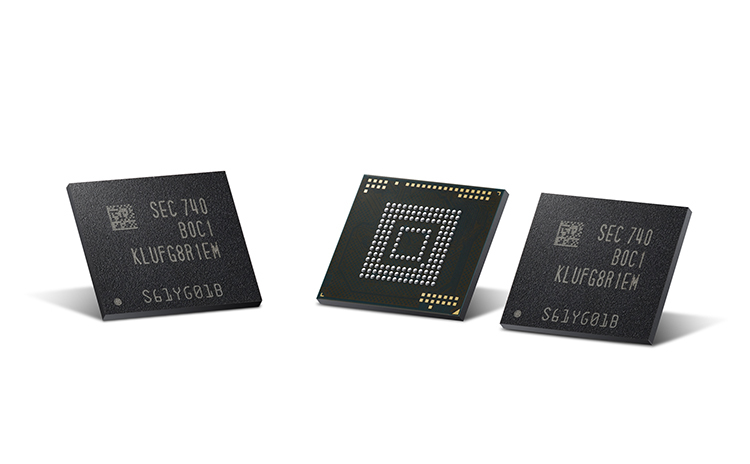 Samsung has started mass production of its high-capacity 512GB eUFS (embedded Universal Flash Storage) that can be used for mobile devices. It utilises Samsung’s latest 64-layer 512-gigabit (Gb) V-NAND chips that helps to drastically improve performance and capacity that can be used in future smartphones and tablets. A single 512GB eUFS chip can hold almost 130 10 min 4K UHD videos and boasts a sequential read and write speeds to up to 860MB/s and 255MB/s respectively. For random operations, the new eUFS can read 42,000 IOPS and write 40,000 IOPS, making it 400 times faster than a convetional microSD card having 100 IOPS. Samsung’s announcement of hardware production is setting up nicely with the impending launch of Galaxy S9. Last week, Samsung confirmed the mass production of its 2nd generation 10nm FinFET chip that could also make its way to the upcoming flagship phone.